4th July, Independence Day. Nothing much to do with me, except that I took the new format JLPT level N1 which is equivalent to the old JLPT1 on that day this year. My 4th attempt, though the previous 3 attempts were in the old format. I wasn’t too sure how I was gonna fare this time. 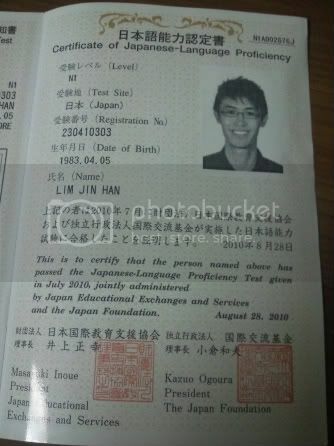 In fact, I was dead sure I was gonna fail till I saw the passing requirements on the official JLPT site. It was then that I thought I may not pass. If that wasn’t clear enough, it was kinda like “sure fail” and it became “may fail”. So the results arrived today at the school. We weren’t told that we were supposed to receive it from our homeroom teacher and she didn’t say anything during the morning class. So, when we found out about it from another teacher, we headed straight to the teacher’s office during lunch but she wasn’t around. I, then, headed to Domy’s to get my lunch bento and as I got back to school, I saw 佐野先生 standing at the lobby handing out the result slips. I finally passed my JLPT level 1! Though I’m not too pleased with the result I got and am thinking of taking it again. Also, I’m interested in doing the 漢字検定 after watching Q-さま。The 漢字 masters were brilliant. Passing requirement for N1~N3 is released but not for N4~N5. 1) To score an overall 100 points and above. 2) To score at least 19 points in each of the 3 sections. 1) To score an overall 90 points and above. 1) To score an overall 95 points and above. Criteria may no longer be as high as the previous 60% and 70% but they’re looking for actual ability to use and a balance in ability. As for comments on the new format JLPT, I must say the listening test is a lot less taxing and simpler as it’s got more to do with real everyday conversation as opposed to really weird content that you probably won’t use in your life. However, the reading and writing was ridiculously difficult for me. I spent 3 months on JLPT N1 prep class and read the entire 完全マスター grammar book for the old JLPT1 and none of the grammar points nor new vocabulary words came out. NONE! It was said that the change in the format was due to the fact that many people who passed the level 1 before couldn’t speak or use the Japanese language at all as grammar and vocabulary lists were released and most who passed merely took the list and memorised them. Which is to say, they knew pretty much nothing else outside the list. So, this time, they decided not to release any lists and the questions can and will come from anywhere and everywhere. I like your English writing and the wording you used. I am still struggling in learning both English and Japanese! Wish you all the best in Japan! Thank you for your message. Frankly, I think the old JLPT is much more difficult, so while they say the new format is tough, I really think those who make the old JLPT will have no problems with the new one. You say you are struggling in learning English but you write like a native. Or perhaps you mean that we are all always learning something about the language. Honestly, I do not think too highly of my own English standards so I am very thankful that you liked my writing. Having been here for a little over 2 years now, I’ve lost quite some vocabulary. The words just don’t appear in my head at the snap of a finger anymore. Maybe I need to get some English books off Amazon.